Whitney built rolling block firearms contemporary with Remington. Whitney rolling blocks are divided into two major systems. Type 1 receivers contain more parts than the Remington, the photo on the right shows the major breech block and hammer components. 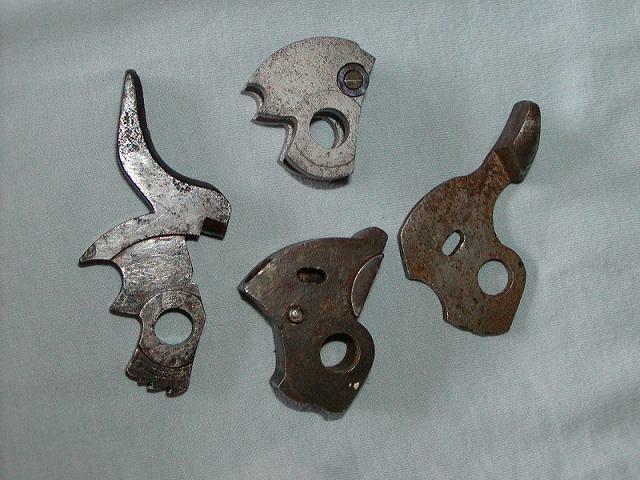 The breech block has a separate plate with thumb lever and the hammer a locking cam. Currently the best source for Type 1 parts is Dixie Gun Works. The second or New Whitney system is very close to the Remington in design. The receiver pins have ears or tabs that are held in place by a single centrally mounted screw. 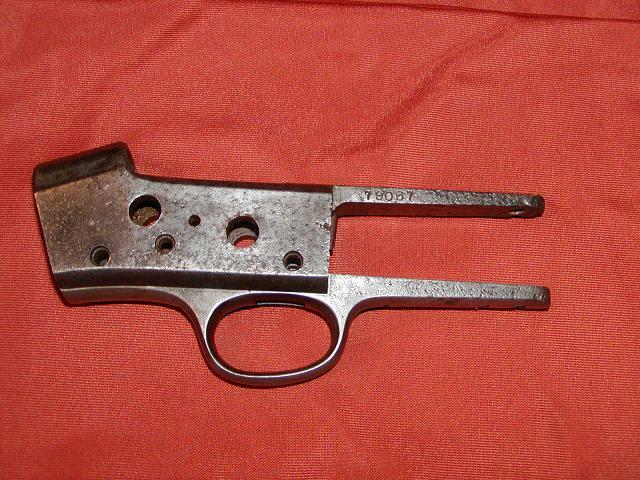 The bare receiver looks much like a #5 1902/1910 or some Swede sporting receivers from the left side. Look for a single shaft, actually a screw, protruding down from the top of the receiver just inside the rear opening at the junction of the tang. (only slightly visible in the left photo below). This functions as the main spring stop in the same manner as the cross pin in the Remington receivers. The trigger guard, hammer, and breech block are about .040 inch wider than Remington parts and do not interchange. Short of measurement, one identifying feature of the trigger guard is the location of the breech block spring mounting screw. Remington's is positioned at the very front end of the guard while Whitney's is located adjacent to the front of the trigger guard bow. Whitney also produced a line of Sporting long guns that are quite similar in appearance to the Remington #1 and #2 Sporting Models. Tang Screw is 15/64- 26.